This great bleached whale sits on a hill above the Reedham to Beccles road, its telescopic tower a landmark for miles. 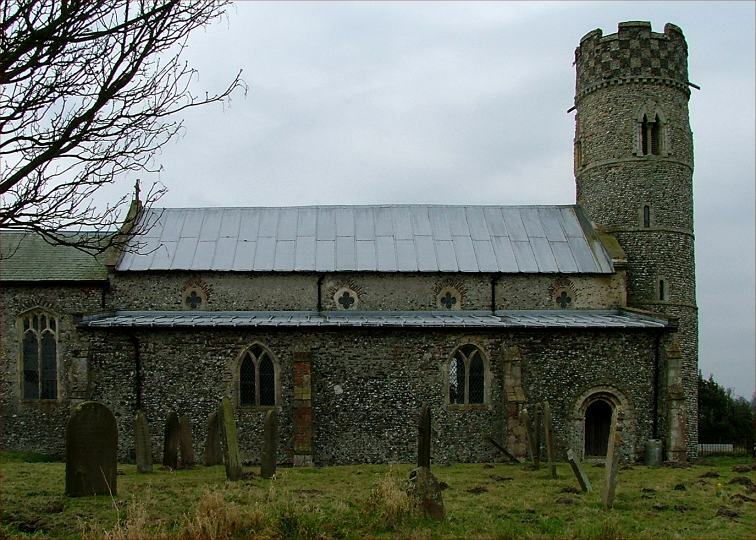 In this corner of Norfolk with hundreds of tiny churches and a multitude of Norman survivals, it stands out as being of tremendous interest, an intriguing and impressive place. To start with the tower: the base is certainly Saxon, the upper parts Norman, the chequerboard top wholly 15th century. This crowning of the Norman with late medieval is repeated on the south side, where the 15th century porch guards a decent Norman doorway and one of Norfolk's best Norman sculptures. Traditionally, it depicts St Peter, although there is no reason to think this; a Priest in eucharistic vestments sits on a throne, hands raised aloft, as if presiding at High Mass. What is he holding? The ironwork of the door is probably contemporary, although the wood itself is, of course, modern. I was interested to see a scattering of owl pellets below it - this sculpture is someone's resting place after a night's hunting. Coming around to the chancel there are a number of filled in round windows. These have been variously described as Saxon and Georgian. Neither seems likely, and they are probably a local 13th century device - you can see the same thing nearby at Toft Monks in work of the same age. They probably date from the original building of the chancel. The north aisle is not of tremendous quality, and was probably built as a lean-to, the arcade then being cut through the Norman north wall. However, a variation in the arcade suggests that there was once a transept chapel on this side. St Mary can be gloomy inside on a winter day, and it takes a moment to adjust to the darkness. When you do, you discover that this is one of those churches that has something from every century, a journey through time. Facing west, for example, into the tower, green light pours from a lancet through the Saxon round-head arch, a foil for the creamy light coming through the elaborate Decorated tracery in the eastern distance. Halfway along the south side is Martin Travers' justly-famous The young John the Baptist greets the infant Christ in a sort of Art Nouveau meets Chinoiserie style, with the church itself set in the background. Above the arcade are surviving wallpaintings - just. The head of St Christopher with the Christchild on his shoulder is clear enough, but the others are fragmentary, and if the scattering further along is really the Three Living and the Three Dead as is suggested, I could not tell. Even more curious are two little niches set in the eastern face of the most westerly arcade pillar - that is to say, to see the images in them you would need to face west. Odd, but there is something similar at neighbouring Thorpe-next-Haddiscoe that was probably a cupboard. There are some good ledger stones of the 16th and 17th centuries, and one in particular is worth a look, because it is in Dutch. This is to the wife of Pier Piers, the dyke reeve, and dates from 1625. There are two corbel heads halfway along the chancel wall, which presumably date from its 13th century construction. Pevsner suggests that they are something to do with the apparatus that supported the lenten veil. I'm not wholly convinced by this, but they do look as if they might have been the springings for a wooden arch. The font is typically late medieval East Anglian. Standing outside, where the ground falls dramatically away southwards to the busy road, it occured to me that the font is as close in time to today as it is to the tower when it was first built. Awesome.